The Nycomm Communications Group is the largest independent communications supply specialist in the UK. With a turnover of more than £130 Million and over 370 happy staff members across multiple UK locations. Nimans is the UK’s leading independent telecommunications distributor. Pennine is a UK dedicated business communication specialist. Rocom is an end user supplier of office communication equipment within the UK. Videonations is a supplier and installer of AV and video conferencing equipment. The Nycomm Communications Group is the largest independent telecommunications and technology supply specialist in the UK – with a turnover of £130m and over 370 dedicated staff. Established in 1981 we work with big name brands such as Samsung, Panasonic, BT and Microsoft as well as major retailers including Amazon, Boots, Mothercare and Aldi. The technology we supply and support helps major blue chip companies and smaller enterprises perform smarter and more efficiently. From sophisticated Unified Communications systems and video conferencing to headsets, telephones and network routers. We also provide network connectivity solutions and mobile services whilst our retail operation features specialist technologies in the nursery sector as well as audio visual, health and well-being, in-car tech, two-way radios – plus more. The Group comprises four main brands of Nimans (comms distribution), Rocom (specific corporate end user sales), Videonations (audio visual and video conferencing) and Pennine (a business communication specialist).We’re gearing up to hit the £150m revenue mark as part of an expanding operation. 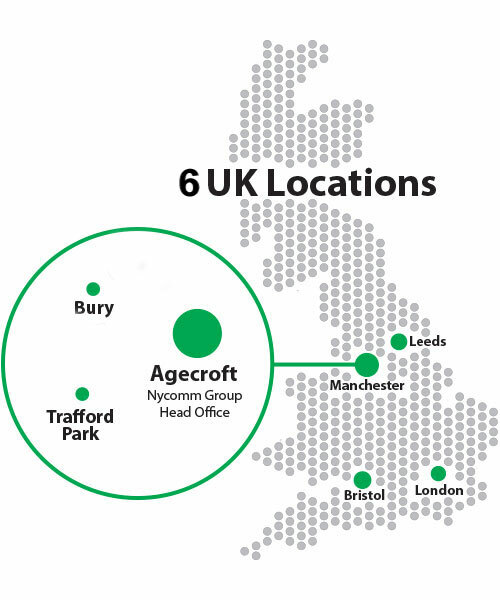 Our modern multi-million-pound headquarters are based at Agecroft on the outskirts of Salford, supported by a network of offices in London, Leeds and Bury. We also have a dedicated Trade Counter pick-up service at our Manchester headquarters and a standalone facility at nearby Trafford Park, providing everything from data network cabling to telephones and installation tools. We come from a family owned business based on traditional family values of service and support. The Group founded by Julian Niman leads with the mission statement to ‘serve the customer’. Investors in People Gold status reflects a culture of career development and the highest levels of staff welfare. Award-winning Nycomm enjoys a respected reputation as a great place to work!